The Dubs ran out seven-point winners. DUBLIN PRODUCED A far from impressive performance when eventually overcoming Clare by seven points in their Electric Ireland All-Ireland Minor Football Championship quarter-final in O’Moore Park on Monday afternoon. The Dubs now advance to a semi-final meeting with Derry on Sunday fortnight and they’ll have plenty to work on after their struggles in retaining possession in a sub-standard first-half performance. Full credit must go to Clare for the manner in which they competed intelligently and with great discipline throughout, especially after they fell four points behind inside the opening five minutes. Kerl Lynch Bissett opened the scoring in the 2nd minute and Dublin looked to have landed a serious blow as Ross McGarry netted from close range after a strong run from Dublin captain Donal Ryan. However, two frees from Gavin Cooney reflected Clare’s confidence as the contest evolved and they took the lead by the 21st minute following two points from captain Dermot Coughlan and another score by Gearoid Cahill. Dublin eventually ended a barren period of eighteen minutes with a McGarry free and the same played converted another close-range effort late on to inch Dublin 1-3 to 0-5 clear by the break. After Ross Phelan had spurned a glorious goal chance within two minutes of the restart, Clare were doubly punished at the opposite end in the 35th minute as McGarry appeared to get the deftest of touches to deflect the ball beyond Stephen Ryan. From that point, Dublin began to relax and four points in as many minutes from Seán Hawkshaw (2), Eoin O’Dea and Ciaran Archer had Dublin ten points clear by the 50th minute mark. Scorers for Dublin: R McGarry 2-4 (0-3f), S Hawkshaw, C Archer (0-1 ’45) 0-2 each, E O’Dea, K Lynch Bissett, F O’Sullivan 0-1 each. Scorers for Clare: D Coughlan 0-4 (0-3f), G Cooney 0-3 (0-2f), G Cahill, R O’Doherty, J Sheedy 0-1 each. 17. Aaron Lynch (St Sylvester’s ) for Maher (44). 24. Harry Ladd (Lucan Sarsfields) for McGarry (59). 19. Gavin Nangle (Naomh Mearnóg) for Kennedy (64). 19. Seamus Casey (Kildysart) for Cahill (39). 18. Ciaran O’Donoghue (Cooraclare) for Phelan (42). 17. Aidan Reynolds (Killimer) for Griffin (45). 23. Paudie Kelly (St Breckan’s) for O’Sullivan (54). 22. Connor Dillon (Ennistymon) for White (57). 21. Colm O’Brien (St Breckan’s) for O’Doherty (61). Email “Dublin ease past Clare to book All-Ireland minor football semi-final”. 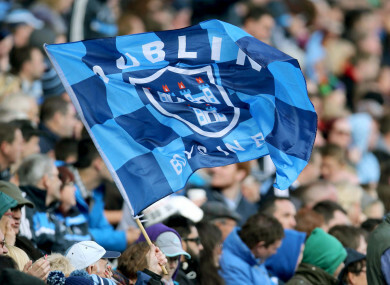 Feedback on “Dublin ease past Clare to book All-Ireland minor football semi-final”.